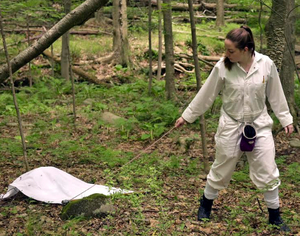 Western Connecticut State University researchers have found the first Asian longhorned tick in Connecticut. The invasive species can harm livestock and, where it originates in Asia, can carry deadly diseases. So far the tick is not known to be a danger to humans in the U.S.
Brittany Schappach, a recent WCSU biology department graduate who works as a research assistant for the WCSU Tickborne Disease Prevention Laboratory, collected the tick, Haemaphysalis longicornis, on July 3 during weekly tick monitoring for the lab. Schappach said she noticed that the tick didn’t look quite like the ticks she typically collected during the past two years. Dr. Neeta Connally, WCSU professor of Biological and Environmental Sciences and director of the tick lab at WCSU, also was not immediately certain what kind of tick it was. Connally sent the tick, which was collected in Fairfield County, to the Center for Vector Biology at Rutgers University where it was first identified using DNA analysis. The USDA National Veterinary Services Laboratory in Iowa then confirmed the identification. “We knew that there was a good chance the tick was present in Connecticut because it was recently detected in neighboring New York state, but we had not seen any unusual ticks among the thousands of ticks we have collected from both residential properties and public forests,” Connally said. The tick has been found in eight other states including Arkansas, Maryland, New Jersey, New York, North Carolina, Pennsylvania, Virginia and West Virginia. Currently, only the single specimen has been collected in Connecticut, but the WCSU lab plans to expand monitoring efforts. “Because we just became aware that this tick is present in the U.S., we still have a lot to learn about how it will behave in the environment and how it will affect the hosts on which it can feed,” Connally said. The long-horned tick is native to eastern Asia, and has become established as an invasive pest in Australia and New Zealand. The first confirmed U.S. collection of the long-horned tick was in New Jersey in 2017, but researchers have since determined that the tick has been present in the U.S. dating back to at least 2010. The tick can feed on many different types of animals, including mammals and birds, and is particularly unusual because it also has the ability to reproduce without mating. This reproductive feature can allow populations of the tick to grow quickly. In its native range, the long-horned tick is a troublesome pest of livestock and is capable of transmitting disease-causing pathogens to humans. Currently it is unknown if this tick species can transmit pathogens to humans in the United States. Because Connecticut is home to blacklegged ticks and other human-biting tick species, Connally suggested that conventional methods for preventing tick bites should work for long-horned ticks, too. “People should always remember that spending time outdoors in our region means that they can encounter a tick,” she said. “Performing daily checks, showering after coming indoors, and wearing repellent are ways you can reduce your risk for a tick bite.” For more information about the long-horned tick or where to send unusual ticks, a helpful fact sheet can be found at http://neregionalvectorcenter.com/longhorned-tick.